In a weekend of unimaginable terror the 10th and 11th of November 2016 will probably not make into any record book but the absolute insanity and loss of life reached an incredible scale this weekend and shows how cheap life has become for our sorry species. A church roof has collapsed in Uyo, south-east Nigeria, killing at least 160 people attending a bishop's ordination. Some reports put the number much higher, with many people believed to be still trapped under the debris. At least five people were killed and 25 injured when a cargo train derailed and exploded in the north eastern Bulgarian village of Hitrino, demolishing around 20 buildings, police said on Saturday. At least three of the victims remain in critical condition and the number is likely to rise, authorities said. A suicide bomber detonated his explosives inside a military base in the southern city of Aden on Saturday, killing at least 48 soldiers and injuring dozens more, Yemeni officials said. It was the latest assault on forces loyal to an American-backed, Saudi-led military campaign to restore Yemen's exiled government back to power. The assault unfolded shortly after 4 p.m. as soldiers waited at the gate of the Solaban military base to collect their salaries in the port city, witnesses said. They had not been paid since September. A fireball from an oil tanker on one of Kenya's main highways has engulfed several vehicles and killed at least 25 people, a Red Cross official said on Sunday. "We have so far collected 25 bodies from the scene of the accident after a lorry heading to Uganda lost control and rammed into several vehicles," said Red Cross official Felister Kioko at the scene. The accident happened late on Saturday night 10 kilometers (six miles) north of the central town of Naivasha. An explosion near Cairo's Coptic cathedral has killed 22 people, Egyptian officials said. The explosion happened at around 10:00 local time (08:00 GMT). At least 10 people have been injured and taken to hospital by ambulance. A suicide car bomber has killed at least 16 people in the Somali capital Mogadishu, officials say. Dozens of others were injured in the explosion early on Sunday. 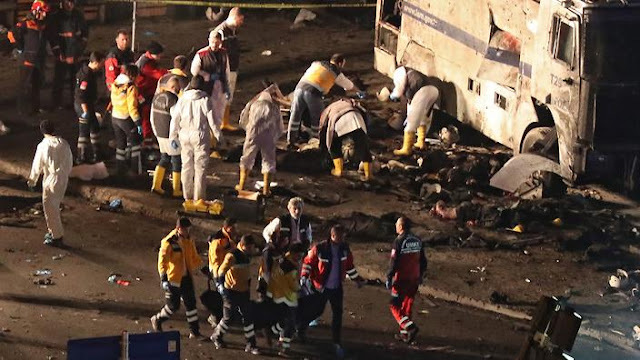 The bomber struck at the entrance of the city's main port facilities. Residents say the blast could be heard across Mogadishu. Russian Defence Ministry says overnight aerospace forces carried out 64 strikes in Palmyra, Syria area, killing over 300 militants.